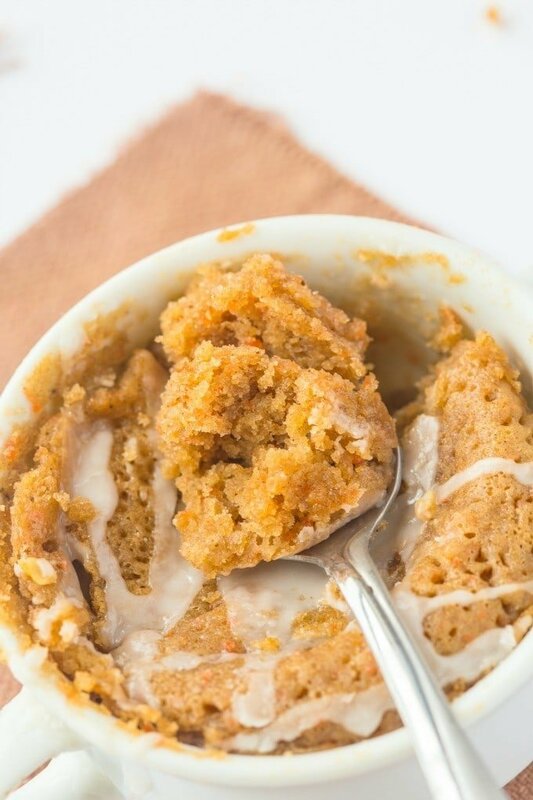 You only need one minute in the microwave to whip up this healthy carrot cake! 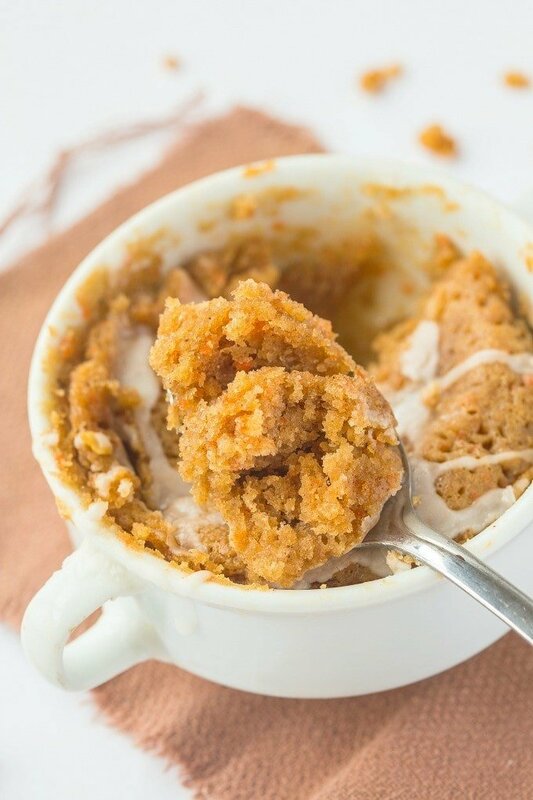 Moist, fluffy yet tender on the outside, this healthy one minute carrot cake is naturally gluten free, vegan, dairy free and comes with a tested paleo option! I seriously wish conversations with my sister would be considered physical workouts. If so, I’d have a body rocking better than Ryan Gosling, Zac Efron and 5 Seconds of Summer combined. We had just been to the movies to watch Bridesmaids (Aussie pride with Rebel Wilson, YO!) and had gone afterwards to get pancakes at the 24-hour pancake parlor. I’d chosen to get my usual, a Spanakopita Crepe (cheese, spinach and garlic) and my sister decided to be fancy- A short stack with STRAWBERRY ice cream instead of vanilla. Don’t ask me how strawberry gets the ‘fancy’ crown over vanilla. Anyway, my sister was inspired by Bridesmaids to discuss her wedding goals. She wanted to have a small wedding and my invitation would be pending under the day before. My mum would not be allowed to open her mouth and Panda would walk her down the aisle. Guests would be served Japanese food but seafood would be banned. She also said Vera Wang would design her gown. I’m not sure which earth my sister resides on, but it’s certainly not the one we live on. Our meals were served and I was thankful to have pancakes distract me and I was able to contain my thoughts. I then had to shatter my sister’s dreams by giving her a reality check and advising her that her wedding dreams were just that- DREAMS. My sister, being her stubborn self, laughed it off and told me I was just jealous and that my invitation was no longer pending- I was not invited. So what does today’s recipe have to do with the above memory? Nothing- Except I know this will be the snack I’ll be enjoying while my sister has this fantasy wedding of stupidity. Unlike her ‘dream cake’, my version’s carrot cake base IS CARROT CAKE and the frosting comes with a CREAM CHEESE option. Seriously, I cannot believe her reasoning for the name. I digress- Let’s ignore her lamenting and jump into today’s delicious creation- A healthy one minute carrot cake! HACK! 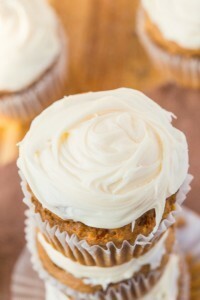 This recipe comes with three frosting options, similar to this carrot cake recipe. While I personally LOVE cream cheese, I have a soft spot for the coconut butter glaze which…well, coconut butter. Make this healthy one minute carrot cake and seriously. If you need a workout without lifting a finger, call Niki. After, you’ll consider burpees to be like rainbows. In a small mixing bowl, combine the flours, sweetener, cinnamon/ginger/nutmeg and baking powder in mix well. Add in your egg white, mashed carrots, optional shredded carrots, dairy free milk and mix until fully incorporated. Microwave for 50 seconds (or up to 2 minutes, depending on your microwave) and remove. Top with frosting and enjoy! 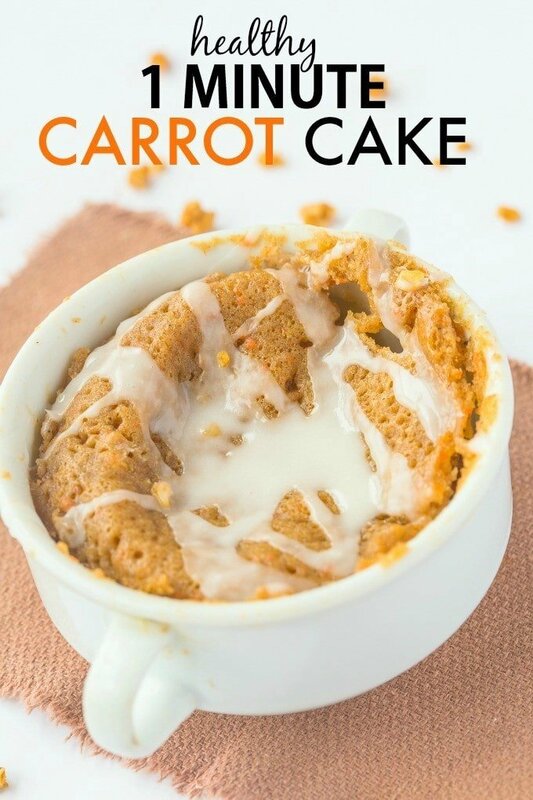 More delicious carrot cake-esque recipes? For those unmarried, what is your ideal wedding cake? For those whom are married, what WAS your wedding cake? I can barely remember what my wedding cake was – that’s how important it was I guess! 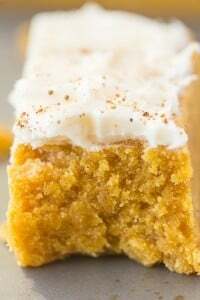 I’m loving these microwave cakes with Paleo frosting! Hahahaha Michele. That’s the best. Ha! That conversation with your sister is hilarious. Kind of sounds like the ones I have with my mother! Lol, your sister is funny. I’d try this recipe out because it is amazing! Now I want carrot cake. Haha oh Niki…. I would love to hear her explain that to her cake baker when she actually does get married. We got married in Mexico and our cake was free as part of our package. I never got to do the whole cake tasting thing. Instead, I selected “cake ‘F'” from the PDF the resort wedding person sent me. It was classic vanilla and was surprisingly one of the best cakes I’ve ever eaten in my life. Our guests were taking extra slices back to their rooms. I would kill to eat that cake again…. LOL. Omg. I will actually film it. That is such a great surprise- Classic vanilla is always on point! It’s so good, I am in such a carrot cake mood! I made a strawberry cake once. I mixed real strawberries into the batter and frosted it with strawberry cream cheese frosting. However, let’s get real, I want a Krispy Kreme donut cake. Clutch. Oh yum- That, or a Mrs.Fields cake! im definitely a chocolate girl so it will be some sort of a chocolate cake…i have never tried mug cakes before but it needs to change because i can see how tender it looks!!! This is so good, you’d love it! That cake sounds incredible. I will need to hunt that down! LOL, I’m always amused by your conversations with and stories about your sister. A fun family you have! 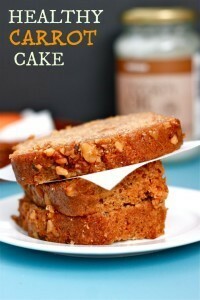 And this super quick and easy carrot cake looks delicious!! Must try! 🙂 Thanks so much, Jenn! omg. You are actually my beta-carotene queen. For-Ever-and-ever. Stefan and I got engaged on vacation and started the cake tasting the very day we came back home. We took it very seriously with a 5 start rating system and different categories. Needless to say it took us several month to choose. Their Carrot Cake didn’t make it though it’s my favorite cake ever. I love the sound of this and I am going to make this mug cake my breakfast tomorrow 🙂 Love the cream cheese frosting since the cinnamon pancakes! That is the best thing ever- I need to know which you ended up choosing!!! OMG. So. I need to message you later. We had red velvet at my wedding and I took the tasting portion of the planning very seriously 🙂 Meaning we did three of them at three different places. Seriously so fun! Hahaha that is awesome, Lauren! Red Velvet is one of my favorites ever- Maybe not the beet version though…. Niki kills me! I had three layers, and the two I remember was a marbled cake and the other was a white cake with raspberry filling. So good! This cake looks legit! THREE LAYERS? Geeze, Mandy. Way to pimp out that cake. You had abit of everything! Your stories always make me smile. That’s a pretty funny cake request. I think it’s also a chocolate mousse cake with the mousse substituted with ganache. mmmmm that sounds delicious, Elaine! One minute carrot cake sounds perfect to me! Stop it, your making me turn green like your smoothie. I looooove carrot cake!! It’s my favorite ever. And that’s saying a lot since I also love chocolate so much. Pinned! 🙂 Thanks so much, Alysia! Have you done and/or will you consider doing a red velvet one? 🙂 it’s my fave. ALSOOOO I learned TODAY that people were not getting notified that I responded to their comments on my blog (I didn’t know you had to have a plugin for that), so SORRY if you thought I was ignoring the comments you’ve made on my posts…I RESPOND TO EVERY SINGLE ONE. oh no! That’s okay! I know sometimes plugins take time to update- Are you getting my replies? Gah, I should double check! LOL carrot cake is ACTUALLY my dream wedding cake. Made by you of course. obviously. I’d eat your slice and give you a baby carrot instead. Haha I prefer carrot cakes without raisins 🙂 A waste of flavor! I have found out recently that I am allergic to eggs, so I am new to all of this. Can you tell me what flax eggs are and how to make them? Thanks! I assume the mashed carrots are cooked carrots? 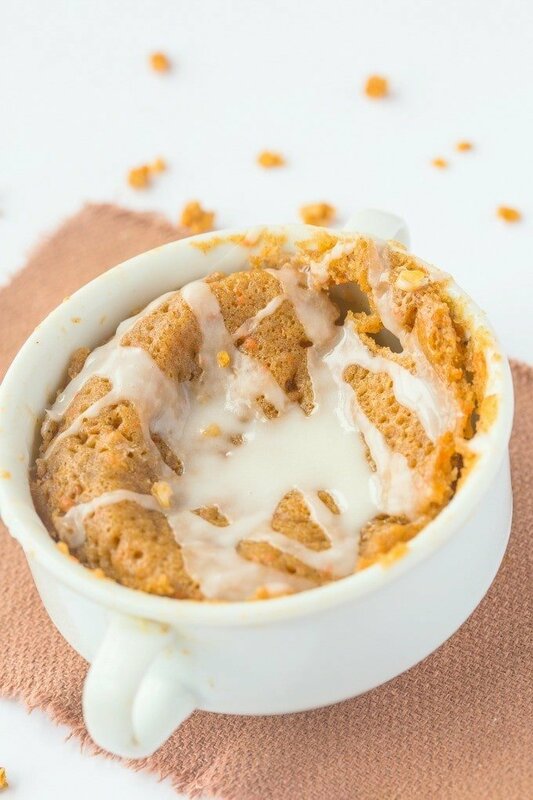 This mug cake is amazing! I have not had carrot cake in many years and have craved it for a long time. This was my personal birthday cake. Thank you! This is delish. Do you know the nutritional information? I was looking but didn’t see it. Hi Kimberly! Sure thing- If you go to myfitnesspal.com and add the ingredients there, it will provide it for you 🙂 Enjoy!